You are here: Home / Events / Branching Out! Building relationships with our corporate clients is something we pride ourselves on doing successfully here at Saffron, so when any opportunity arises to expand our client list, we are keen to take it! Earlier this summer, we were invited to tender for an opportunity to not only provide corporate buffet lunches, but also to run a staff canteen’s deli offering. The client is a very successful multi-national company, and their offices based in Nottingham recruits over 300 staff, so definitely a lucrative opportunity! Having always offered outside catering only, we quickly pulled together a management meeting to discuss if this opportunity was for us. As Saffron has grown so much over the past 2 years that we are now keen to take on other challenges and expand the services we offer, therefore the team agreed to go for it. Entering into any tender process is no easy task, the first request was to meet with the client and her team for a chat about what is required and potentially what we could offer to see if there was a match. It was also the chance to see the staff canteen area and consider how we could make improvements. This meeting felt very positive and the more we heard about the company, its values and its requirements, the more we felt it was a great opportunity for us. The second stage was for us to host a meeting with the team at our premises, allowing an opportunity to see our fantastic catering unit and also the way we work in the kitchens. Again this was a great success! Next up was for us to deliver a sample buffet to the team for their enjoyment. Based on this the client was able to see what our suggested menus consisted of, how they are presented and is also an opportunity to ask questions about the corporate buffets and the process of delivery etc. Again only positive comments were received and we were so pleased to be offered the contract of the corporate catering and the deli! Go Team Saffron! 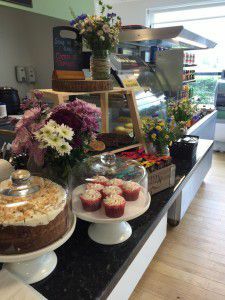 We had to move quite quickly after being offered the contracts and with only 4 weeks of planning, preparation, equipment ordering, menu discussions, kitchen kit out and the re-decoration of the deli area, we were ready to go! We selected the green back wall colour to go with our re-brand and we loved the idea of a chalkboard which offers a fresh and clear menu for the staff to select from. We added smaller menus to each table and also fresh flowers which helped make the area feel a little more comfortable for people to eat in. Offering a range of food items such as Panini’s, jacket potatoes, salads, cakes and drinks, the staff have enjoyed this fresh new feel to the deli and 6 weeks in, even after a few initial teething problems, we deem the project to be a success! Having met with the client representative only last week for a performance review, we discussed how to take things forward together, coming up with new ideas and suggestions for improvements which was a really positive meeting. We also scored very highly on the performance review, something which we are really pleased about. Taking a chance on trying something new is always a risk, but if that risk proves to be successful, then it is well worth taking and sometimes you just never know until you give it a go!